At many of Crowley’s political events, he loves to brag about his Irish background. Yet, he feels it is fair to deny Ocasio-Cortez any opportunity to speak about her heritage and background, seemingly solely because she is Hispanic. Having all the power of being the Queens party boss is not enough for Crowley. He wants to use the privilege he has as a White male in power to snuff out his opponent by stoking fears about ethnicity or race to his largely White audiences, as his recent political event was described. Long before Ocasio-Cortez ever decided to challenge Crowley in a Congressional primary this year, though, Crowley made issues of race central to how Queens was going to be governed. One need not look too far to see how Crowley has used race and White privilege in Queens to further his own ideas about what is fair about who holds elected office. Before Crowley inherited his seat in the U.S. House of Representatives, Richard Brown (Establishment-NY) was first appointed and then reëlected, uninterruptedly, as the District Attorney for Queens County. Now an octogenarian, Brown has said he has no plans for retiring. Though he holds elected office, Brown acts as if being the District Attorney is a job he gets to decide how long he keeps. Like Crowley, Brown acts as if he is entitled to his elected post. The major problem caused to Queens County voters is that Brown is resisting criminal justice reform, as called for by Ocasio-Cortez. Brown wants to keep arresting his way through the opioid crisis, even though Whites are shown to mainly be turning to dangerous synthetic painkillers as lifestyle drugs. Because Brown also resists speedy calls for legalizing marijuana or decriminalizing other crimes that disproportionately affect minority communities, criminal justice in Queens is prosecuted with race-based overtones, notably Broken Windows policing. Since Brown runs for elected office with the explicit consent of the Queens machine, which is headed by Crowley, Crowley is responsible for how one’s race or ethnicity determines one’s experience when it comes to our justice system. Not only that, but the culture of unaccountability that runs through Queens County politics, which makes Brown believe that his elected office is his until he no longer wants it, is the making of the boss of the Queens machine : Crowley, himself. Ocasio-Cortez is not making this political primary about ethnicity or race ; it is Crowley, who is making it about the privilege and culture of unchallenged power, which he’s gotten so used to. By now, Crowley has been in Congress for 20 years, and he’s been the Queens party boss for 12 years. 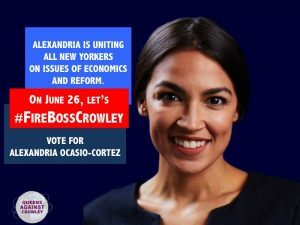 Crowley’s complaints about divisiveness should rightly fall on deaf ears, because Ocasio-Cortez has been espousing a political campaign that aims to unite New Yorkers on issues that affect everybody, regardless of ethnicity or race, such as the unaffordability crisis in rents and the need to reform our criminal justice system. The only person who is confusing race or ethnicity with power and privilege is Crowley.